Each month we will highlight a different PSI plasmid or plasmid collection which may interest you. Thermotoga maritima is hyperthemophilic, rod-shaped gram-negative bacterium originally isolated from geothermal-heated marine sediment in Vulcano, Italy. Thermotoga maritima is phylogenetically very important, because it appears to represent one of the deepest lineages in Eubacteria. Since the Thermotoga maritima genome has the highest percentage (24%) of genes similar to Archeal genes, it would appear to be an ideal system to study domain organization and identify new or highly diverged protein folds in both Eubacteria and Archea. The genome of T. maritima is a single circular chromosome of approximately 1.8 Megabases in size, encoding for an estimated 1877 proteins. Its optimal growth temperature is approximately 80°C (176°F). T. maritima has unique metabolic properties related to its capacity to process a diverse set of carbohydrates, utilizing sulfur as an electron receptor and producing hydrogen during fermentative growth. Its genome was sequenced in 1999 and surprisingly revealed many genes of archeal origin (1) suggesting possible similarities to GC-rich gram-positive bacteria, such as Clostridia or Mycoplasma. At the time of its discovery, it appeared to be a unique organism, but now the phylum Thermatogales has more than 20 known members including mesophilic and moderate temperature-adapted species. Its exact phylogenetic position in the Tree of Life is still hotly debated. Because of its compact size, Thermotoga maritima is an ideal model for systems biology and metabolic reconstruction simulations. It has one of the smallest genomes among free-living bacteria, with a very rich set of carbohydrate metabolic genes, as well as an extensive set of diverse transmembrane transporters. Its unique features, both from phylogenetic and metabolic perspectives, are the focus of intensive research. 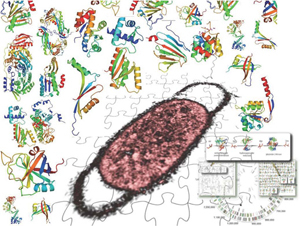 The Joint Center for Structural Genomics (JCSG) initiated the Thermotoga maritima structural genomics project at the outset of the NIGMS Protein Structure Initiative (PSI) (2) with the eventual goal to provide complete structural and functional coverage of this emerging model system. Structures of over 170 unique Thermotoga maritima proteins have been determined at the JCSG, with many interesting results described in a number of papers (see publications listed below). Highlights include the structure-based discovery of a novel thymidylate synthase (3-9), structure determination of the integral membrane transporter (CorA) (10), exploration of protein thermostability (11-12), and many other structures (13-22). Expression, purification and structural determination of Thermotoga maritima proteins at the JCSG were critical for the development of the JCSG high-throughput pipeline and have been described in a number of publications (23-32). In the latest development in this project, a complete three-dimensional reconstruction of the central metabolic network of this organism was achieved by a combination of experimental structure determination and comparative modeling (33). In total, 1800 of the 1877 Thermotoga maritima ORFs were cloned into expression vectors at the JCSG. The PSI-Materials Repository now has 1134 fully sequence-verified clones from this collection available for requestors. The full list of clones can be found here.